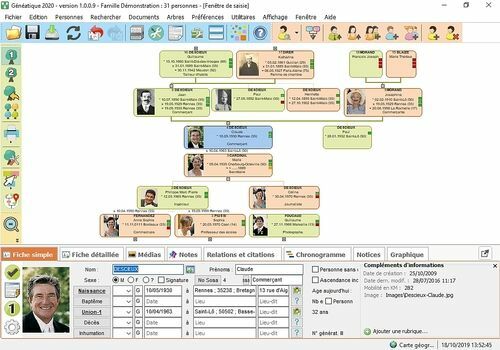 Get to know your family better thanks to Généatique 2019, which helps you to set up your family tree in no time. To do this, you will need to introduce your family members one by one. The software has an easy-to-navigate interface that divides the screen into two parts: one for the graphic part and the other for the input mask. The ideal is to start working from ancestors to close with the current generation. Build a database on your family members with more than detailed information taking into account photos, videos and Sosa-Stradonitz numbering. With Généatique 2019, you would benefit from a multitude of features and options, improving the design of your family's genealogy. Indeed, several genealogy models are available in the software with the desired colors and various backgrounds. From now on, you would no longer be able to miss in the search for a loved one from your large family. Download Family Tree Builder for free on your computer, and make your family tree in no time. Already adopted by millions of people around the world, this software includes a lot of tools to customize your tree, and compare it with that of others. Gramps Windows is a free genealogy software designed by and for genealogy enthusiasts. The latter includes all the tools necessary to create a family tree, such as the creation of individual records, the location of living spaces, the relationship between each member, etc. Heraldry software for family and coat of arms research. Assisted search on: blasonnement, motto, ornaments, armorials, on 400,000 families, names, etc., operators "with, without, and", inverted, classes, etc. Heraldry software (EURALDIC / see other software) allows access to databases (blasonnements and drawings by d'Hozier). Gathers all the data from the euraldic.com website.